Ability Text: Put target creature with flying on the bottom of its owner's library. 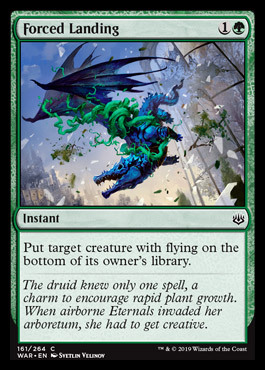 Flavor Text: The druid knew only one spell, a charm to encourage rapid plant growth. When airborne Eternals invaded her arboretum, she had to get creative. Click the Column Headers to Sort. Shift + Click will Sort Additional Columns.